Enter a world of calm sophistication, which reflects the distinctive period architecture of the building. Enjoy your meal whilst overlooking tranquil views of croquet lawn, terrace and gardens, Gilbert’s Restaurant offers superb food with a vast selection of excellent wine. Gilbert’s restaurant has an excellent reputation, yet still offers excellent value for fresh homemade food. Nowhere else offers the same quality of cuisine at such competitive prices so its not surprising that our recent menus have been a big hit with both the hotel’s guests and local residents! 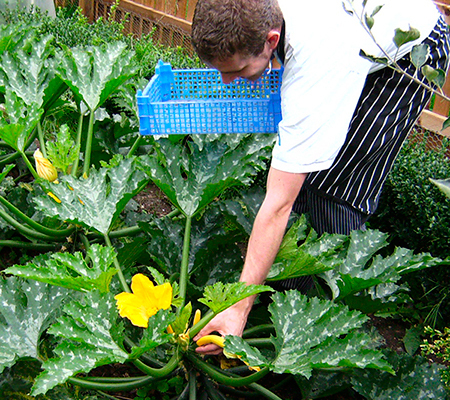 A great feature of the Restaurant is the use (whenever possible) of home grown seasonal vegetables, herbs and fruit from the hotel’s extensive vegetable gardens and orchards help to ensure only the freshest ingredients on the menu. NOTE: Gilbert’s Restaurant is closed for lunch service on Monday and Tuesday. However, we offer an extended bar menu in The Drawing Room and/or Library Bar.